As the primary unit responsible for the preservation of peace and protection of life and property, the Operations Division maintains a 24-hour-a-day City patrol. The Division enforces laws, conducts preliminary investigations of crimes and apprehends offenders. Patrol is the primary first responder to calls for service and proactive policing. The primary patrol section includes three patrol watches: Day (A) Watch Section, Night (B) Watch Section, and Morning (C) Watch Section. The various working hours of the watches provide the 24 hour City patrols. Special units within the Division are the Public Service Officers (PSO), Crime Impact Team (CIT), Gang Unit, K-9 Unit and the Pier and Harbor Services Unit. Community Services Officers (CSOs) handle complex reports and respond to a variety of calls for service city-wide freeing up patrol officers to respond to crimes in progress and other emergency calls for service. Community Services Officers conduct preliminary investigations of traffic accidents including fatalities and all felony and misdemeanor crimes. 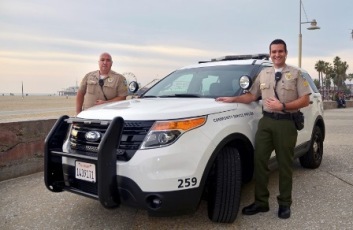 Having gained expertise as traffic collision investigators, CSOs are able to testify in collision reconstructions and provide estimations of speed for report purposes. Their investigative duties include gathering evidence, questioning witnesses, taking photographs and generating reports for financial crimes such as identity theft, embezzlement and fraud.